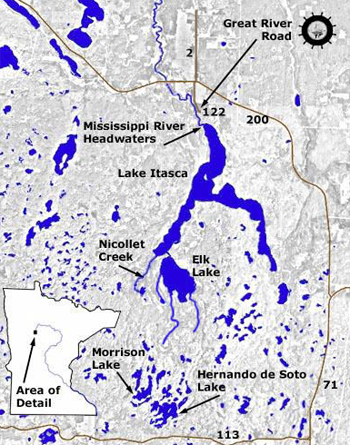 Following this rule the source of the Mississippi, with its wealth of tourism, would be within Leech Lake Indian Reservation two counties east of Lake Itasca. (S.J.). In 1832 Henry Schoolcraft identified Elk Lake (Ojibwe: Omashkoozo-zaaga’igan) as the source of the Mississippi River and renamed it Lake Itasca from the Latin veritas (“truth”) and caput (“head”). Schoolcraft also coined other pseudo-Indian place names. French mathematician and geographer, Joseph Nicollet, mapped the upper Mississippi basin in 1836-7 and noted that the Mississippi flows into as well as out of Lake Itasca. A series of lakelets and marshes as much as 300-feet higher than Itasca feed downhill into Elk Lake and then into Itasca. Jacob V. Brower, a land surveyor and president of the Minnesota Historical Society, settled the (political) dispute about the source of the Mississippi. In 1888, after exploring the area for five months he ruled that the lakes and streams further south of (but uphill from) Lake Itasca were not the true source of the Mississippi. Brower campaigned aggressively to save Lake Itasca from logging by Weyerhauser companies. On April 21, 1891, the Minnesota Legislature officially made Itasca a state park. The Mississippi is 2,350 miles long. She is fed by more than 40 tributary rivers emptying waters from Minnesota to Louisiana (north to south) and from New York state to Idaho (east to west). The Ohio River is her greatest tributary in water volume but the Missouri, out of the Rocky Mountains, is 217 miles longer than the Grandmother of Rivers.